Now that I’ve returned to the world of Nikon APS-C format sensors, I need a reasonably good lens kit. I don’t require the big, fast glass I used when I shot full-frame. Back then, I’d carry a Nikkor 24-70 f/2.8, 70-200 f/2.8, and sometimes a 16-35 f/4. Toss in a full-frame body, and you have a bulky, heavy setup. On the other hand, I want reasonably good glass. I’m willing to trade off some speed for weight, given the high-ISO proclivities of the D500. However, I don’t want to give up too much, if only because being able to take advantage of some depth-of-field effects lacking when I shot micro 4/3rds would be useful. So I put together the following lens setup. 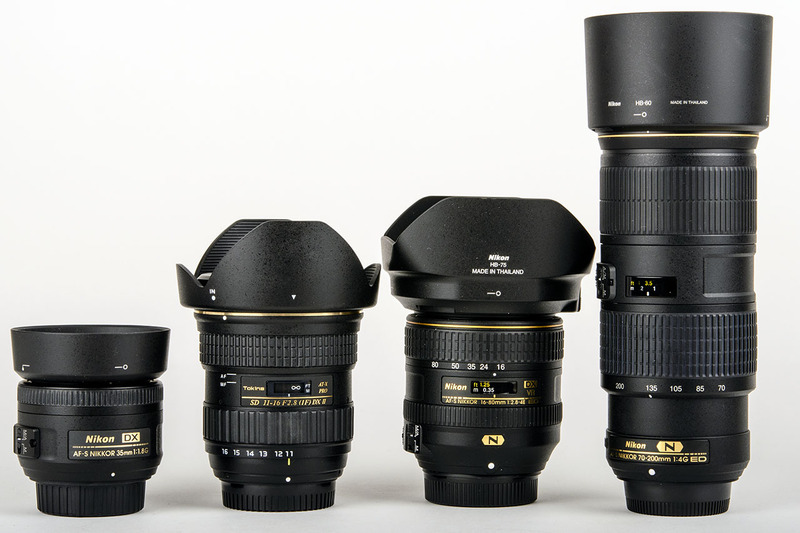 I’m listing my prime lenses first, then discussiong my wide to telephoto zooms in focal-length order. Nikkor 35mm f/1.8. Is this perfect? No. But it’s damned good for well under $200. The 35mm focal length is roughly equivalent to “normal” on full-frame. I use primes rarely enough that sinking big money into something like a Sigma Art lens seemed excessive. At some point, I may be looking for a good portrait lens, and that’s when I’ll look at a more capable prime. The 35mm f/1.8 gives me reasonably shallow depth-of-field in a “normal” lens, and works well enough when I feel the need. Nikkor 60mm f/2.8 Micro. This macro lens (Nikon insists on calling its macro lenses “micro”) is actually a full-frame design, but it gives me just a bit more reach — roughly equivalent to 90mm on full-frame. It’s a capable, if unexceptional, lens that I’ve used fairly often in the past for product photos. You don’t see it in the lead photo for this post because the lenses shown were shot with the 60mm mounted on the D500. Tokina 11-16 f/2.8. This nifty wide zoom lacks the compact size and reach of Nikon’s own 10-24 f/3.5-4.5 wide zoom, but it’s also faster, at f/2.8 throughout. So far, it seems sharp enough, and cost me well under $500. Nikkor 16-80 f/2.8-f/4. This is my go-to, workhorse lens that lives on the D500 most of the time. If you buy the D500 kit, this lens ships inside the kit. It’s equivalent to 24-120 on full-frame, though loses a little speed at full extension. I shot hundreds of photos with its older sibling, the 16-85 f/3.5-f/5.6 with my old D300, so this lens feels like a natural successor. It’s faster wide-open and at full extension than the older 16-85, but actually weighs an ounce less. It’s seems sharper, too, though it suffers a bit from vignetting when wide-open, much like the older lens. Nikkor 70-200 f/4. This is a sweet, sweet lens. It’s roughly $700 less and 1.5 pounds lighter than the 70-200 f/2.8. I will grant you the 70-200 f/2.8 may be a little sharper, and more resistent to the elements, but its f/4 sibling is pretty damned good in its own right. Thom Hogan wrote a glowing review of this lens, and spoke highly of it. That’s the current lens kit I’m using with the D500 today. I’m eyeing some other lenses in the longer term, such as Sigma’s 50mm f/1.4 Art lens for portrait photography. If I ever need longer reach, Nikon’s recent 200-500mm f/5.6 would fit very nicely. But those are pretty specialized, and not something I feel I need for the moment as I continue to learn the ins-and-outs of the D500.